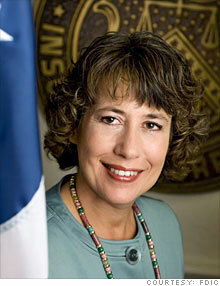 I have always held Sheila Bair in high regard. Why? I believe she has no agenda other than what is best for our country. I find her to be tough, but fair. I think she prioritizes integrity, transparency, and reputation–all of which we badly need, but are in short supply. Ms. Bair is currently engaged in an active debate about potential management changes at Citigroup. She is no shrinking violet in taking on any and all Wall Street heavyweights. I commend her for that. Additionally, she is giving “no quarter” in defending her positions on financial regulatory reform. Sheila Bair, chairman of the Federal Deposit Insurance Corporation, said Friday that while the crisis that swept through the financial world last year has subsided somewhat, it was far from over and there would be “many more bank failures” ahead. Her cautious comments come as investors have been increasingly cheered by news in the banking sector. Markets were reassured by the results of government “stress tests” that evaluated how the 19 largest banks would perform during a worsening recession. Do you get the sense that she is trying to properly manage expectations for those who may be getting overly ebullient about the rebound in our equity markets? I do. Why is Ms. Bair sending this messgae? She knows what the banking system truly holds. She is far better positioned to provide a clear window into these banks than Turbo-Tim Geithner or Big Ben Bernanke. I strongly recommend we listen attentively to her. Will the Brave New World of the Uncle Sam Economy implement real regulatory reform or will it be nothing more than repositioning the deck chairs? Bair is adamant in defending her positions and not kowtowing to Geithner or other regulators on this front. While Geithner and the Obama administration have sent clear signals that the Fed will become even more powerful in the regulatory reform process, Sheila Bair . . .
worried aloud about the current trend toward making the Federal Reserve banking’s regulator-in-chief. She cautioned the Fed could find itself making “severe trade-offs” between the needs of consumers, businesses and the economy as a whole if pressed into service as America’s top banking regulator. “No other developed country gives their central bank the kind of power we give our central bank,” Bair said. I raised this same failure on the part of the Fed the other day in writing The All Powerful Federal Reserve.